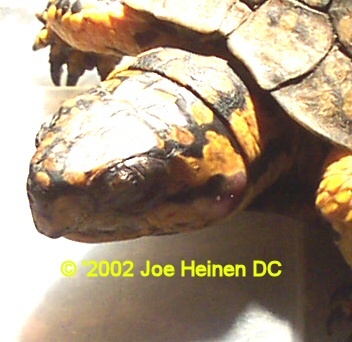 Box turtles are very prone to eye infections/problems. They may present as one or both eyes "glued" shut. In other cases the eyes may be swollen. Mucous and or pus may be present. In long standing infections a hard "plug" of mucous and pus may give the appearance that the eye is missing. In the wild eye problems are fairly common after a turtle comes out of hibernation. I recall finding one a few years back in February walking down the road. Its left eye appeared to be missing. 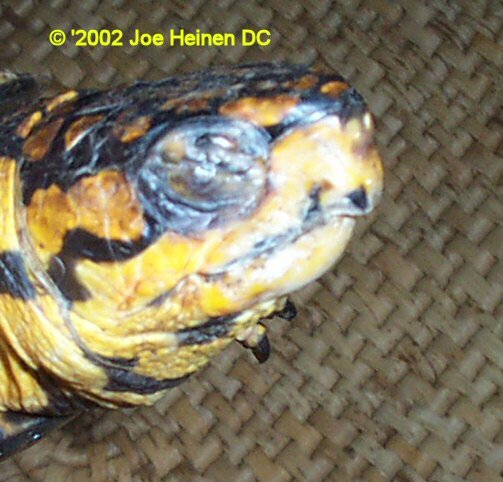 As I was handling it a large plug popped out and the eye was visible behind a layer of puss similar to the picture below. The turtle below came out of hibernation with the eyes glued shut, an ear abscess and a respiratory infection.